Bootie LA – LOL Cats Night! 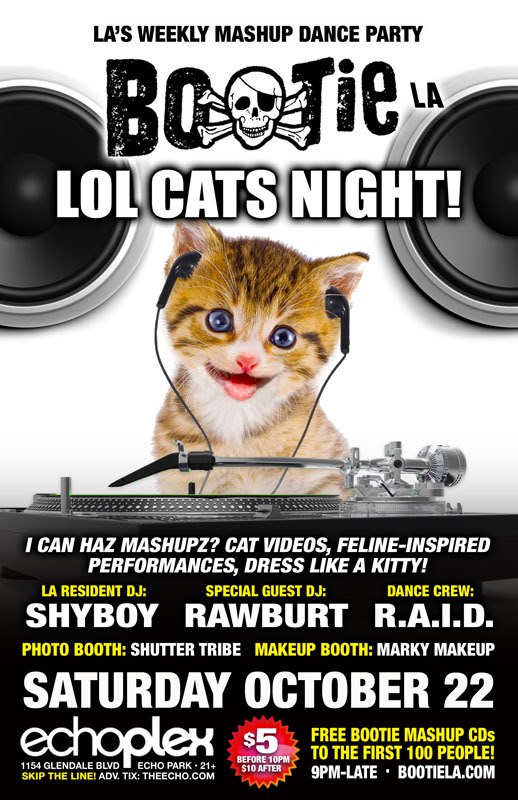 Los Angeles Bootie LA – LOL Cats Night! I can haz mashupz? Bootie LA celebrates the silliness of LOL cats and cat memes with a feline-inspired night of mashup madness! Dress like a kitty! No genre or era is safe! Only $5 before 10 PM! I can haz mashupz? Cat videos, feline-inspired performances, dress like a kitty! Can Bootie really turn a meme into a party theme? Of course we can! Because … cats. It’s time for LOL Cats Night! The Echoplex screen will be filled with cat videos and memes and feline-inspired performances will grace the stage. Dress like a kitty and dance to the best mashups in the world, as Bootie LA’s ShyBoy and Rawburt mix and mash anybody and everybody, keeping your tails bouncing on the dance floor all night long! Resident dance crew R.A.I.D. (Random Acts of Irreverent Dance) takes over the stage with catlike go-go madness, while Marky Makeup gives your faces and bodies a feline makeover, and Shutter Tribe captures all the fun! All this, plus FREE Bootie mashup CDs for the first 100 people through the door!